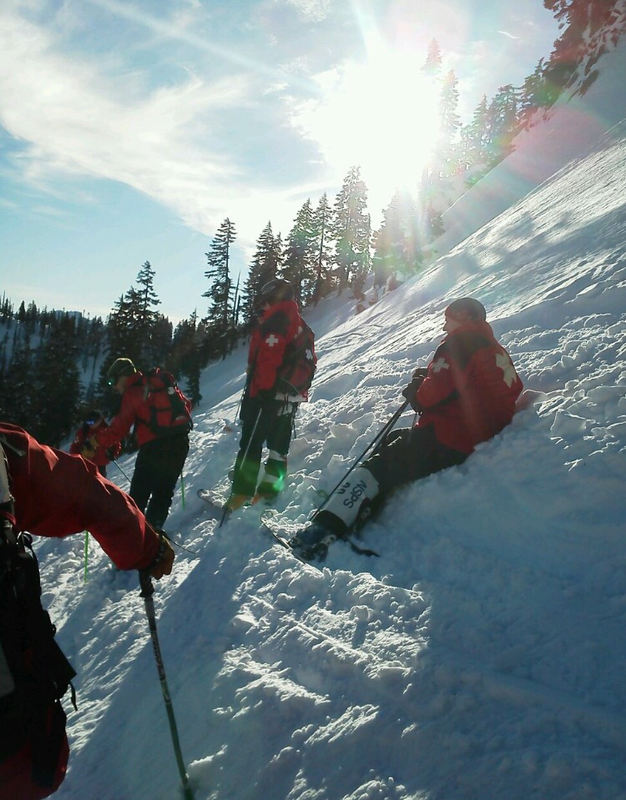 As many of you know, a big part of my life is being a volunteer member of the National Ski Patrol. This is my 10th season as a patroller with Snoqualmie Pass and even though I’ve taken this year a little slower than previous ones, I know I’ve still got at least a few more years left in me. Saturday night was significant for me and worth sharing. I was partnered with Matt K. and we were making our way to the base of Central Express to help close the mountain when a call came in for an injured person at the tubing center. Being the closest, we headed over, and I agreed to take lead on the call. When we walked in and I approached the patient, I knew immediately that something was wrong. I turned to Matt and said “sick” for the first time in my patrol career. And we sprang into action. Now for those who aren’t patrollers, we are trained in sick/not sick protocol. Based on several signs, symptoms, etc. we are able to rapidly determine if this patient is in need of immediate advanced level care (i.e. we need paramedics or a helicopter NOW) or if we can go through our routines and provide care as necessary and determine if this is an ambulance transport, if they can get a ride home, walk out, etc. Of course, this is a very broad generalized overview, but you get the idea. In my years as a patroller, I’ve called “not sick” on the radio many times. I’ve heard from other patrollers who have been on these kinds of calls that when you have a “sick” patient, you just know. I believed them, but did not understand quite how true that is until Saturday night. How did I know from a few feet away that she was in trouble? I replay it and wonder and have started pulling pieces together. Her skin color was off, the way she was postured and swaying, the feeling around her, all manner of things. But the patrollers who have come before me were absolutely right. I just knew. Matt was an amazing partner. He asked the right questions to help me gather the information we needed, and when I needed something he was handing it to me even as I was thinking it and hadn’t verbalized the request yet. As other patrollers and the local fire fighters arrived to help, the amazing teamwork continued and we had her out to the ambulance and on her way to the hospital faster than I thought possible. I was told that the time from initial call to transport was remarkable. I credit that to having a partner I trust and click so well with, a fantastic team who relayed our information as quickly as we provided it, and our wonderful local first responders with Snoqualmie Pass Fire & Rescue. For me, this is a story about when it all came together and everything finally clicked. It is a reminder of why we train and go through refreshers and review the same information over and over. Maybe it feels mundane and repetitive to go through the motions over and over, but there’s a reason for it. Somewhere in my thick head, details have been sticking and mental pathways have been built for days like this. I’m sure it’ll be hard to maintain enthusiasm for all the trainings I’ll continue to go through, but for now, it’s a good reminder of why we do things. It’s also a time to pause and give thanks for the remarkable people I am privileged to work with. Thank you for having my back, Matt. And SPFR, you guys rock! If you are interested in becoming a ski patroller… you know where to find me!